One of the most commonly asked questions we get asked regarding our jewellery is how to clean it. Currently, there are masses of silver cleaning products on the market that all promise to give you gleaming silver in seconds. In this guide we will tell you which cleaners are worth purchasing (tried and tested) for certain types of jewellery. Remember though the term 'cleaning' essentially means removing the top fine layers of silver to reveal the brighter, cleaner surface underneath. 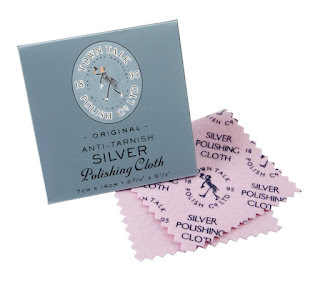 Tried and tested in our store these polishing cloths are great for general jewellery cleaning. These work well on plain silver rings, earrings and necklaces etc. these can also be used carefully on pieces containing precious stones. This clever cloth works in 2 steps, one side is treated with a concentrated cleaning solution (plain side) and the other side acts as a buffer (printed side). 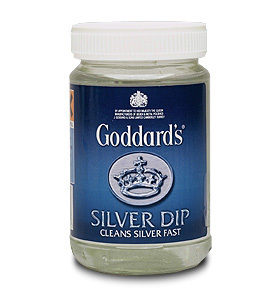 A good tip when using this product is to polish using a side to side motion, not a circular one as this will minimise the amount of silver you remove. Inexpensive and very durable, they have a long shelf life and can be used over and over again to keep your jewellery looking its best. Another product that we use in our store is silver dip, an easy to use product but more care needs to be taken when using this. There are many silver dip solutions on the market and they generally all give the same results and should be used sparingly. One of the first things you will notice with this product is the smell, it contains a high dose of sodium hydroxide which eats the tarnished silver in seconds. We like to use two simple tools to clean any fine design details or small crevices on the jewellery, a toothbrush and cotton wool buds are gentle but effective. When using this product make sure you are in a well ventilated area and wear protective gloves as this can be a strong skin irritant. A very simple and eco friendly way to clean your silver, is to use a diluted solution of lemon juice (half a cup) and warm soapy water. Using a soft brush gently clean the silver using a side to side motion, use the bristles to clean hard to reach areas. Thoroughly rinse the silver in clean water and buff with a soft cloth for a shiny finish. IT'S NOT ADVISED TO USE THIS CLEANING TECHNIQUE ON POROUS GEMSTONES.